"We might as well take our fiddles and break them across our knees." - Fritz Kreisler after hearing Heifetz. Here is the review from the Kansas City Times, February 13, 1918. A Genius in Tone, He Also Excels in Chaste, Intelligent Interpretation-A Rather Personal Attitude Toward Audience. 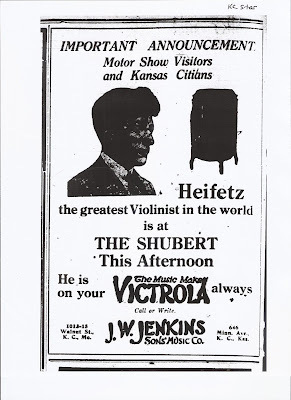 An audience of high expectations filled the Shubert Theater yesterday afternoon, even to stage and standing space for Jascha Heifetz's first concert west of the Mississippi. 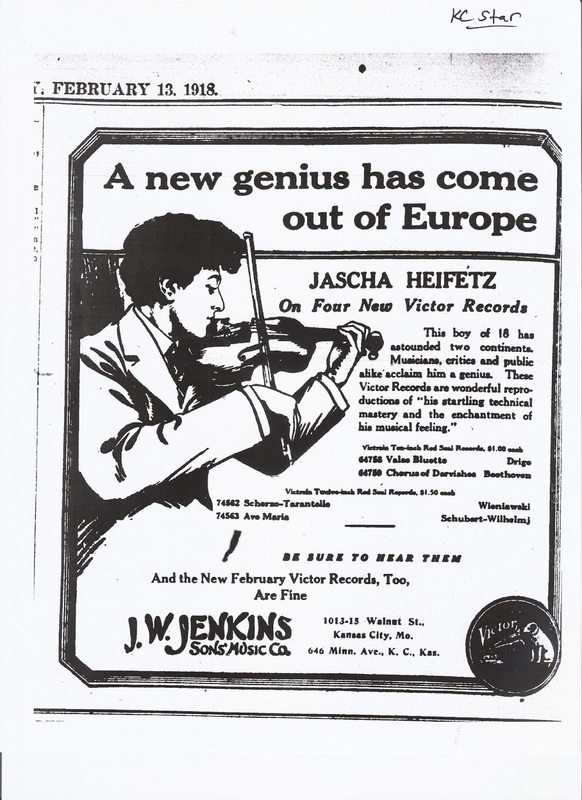 News of the violinist began coming to America before he left Petrograd. Leopold Auer was said to have rated him highest of all the students who had come to him in almost fifty years of teaching-even to have seen in him such genius as is born into the world only once in a couple of centuries. 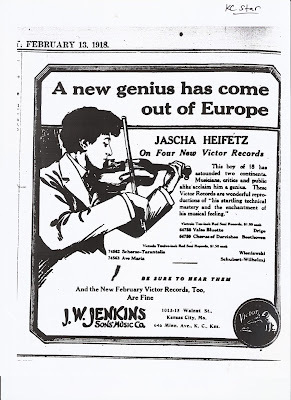 If stories of his playing created expectation of the phenomenal, some must have been disappointed, for Heifetz has nothing of the youthful prodigy about him. It would be impossible to discover anything sensational in his performance, apart from its dignified perfection and those qualities that appeal to musicians rather than to that portion of the public interested in freaks. The violinist did not warm to his audience. So far as he was concerned, the concert was an affair of the musical verities, as they might be expected to exist between artist and composer. The audience might enjoy if it was able. As to that, Mr. Heifetz refused to assume responsibility. That is what his manner seemed to say. But while he plays, manner is forgotten. There are long passages when his audience convinced that the difference between this violinist and others is one of tone. Surely no one in this generation has drawn a tone so luminous, so full of silver resonance. But presently tone is forgotten in the breadth and power of his playing or the deluding ease with which he accomplishes feats of bravura. Whatsoever the exactions of a composition, they are met with taste and feeling and a commanding intelligence. There was gentle singing in the Haendel sonata and the Wieniawski concerto was full of character, its errant rhythms given a new definiteness; the finale of Paganini's embroidering flashed splendid jewels instead of its wonted glitter. When it came to the Chopin nocturne in F minor, which Auer has arranged for violin, there was the hoped-for, but hardly expected, poetry. Keat's "Ode to a Nightingale" has no deeper shadows than Heifetz has found in the nocturne. The sheer beauty and repose of his style were disclosed in this manner as in nothing else. It conveyed reasonable conviction that Mr. Heifetz will not join the already too long line of youthful violinists who have been more increasingly content, as the years have passed, to make dazzling display of technique. There is the slim and agile left hand performing feats of speed and accuracy, but not even in the technical feats is the listener permitted to forget the directing mind. The audience may have felt a little thrown back upon itself by the artist's imperturbable manner. It was enthusiastic and gave him many recalls, but not so many as it has given other artists in the same theater. There was a certain lack of sympathy between artist and audience, but what else might be expected as between the mature women of his audience and a rollicking youth, who early yesterday jabbed a finger at each and every pushbutton on the street car as he fled laughing to the rear door?